Thanks to a boost today from a Russian and Ukrainian rocket-for-hire company, a U.S. private space firm has sent a novel expandable module toward Earth orbit-and a step forward in providing commercial space habitats. Bigelow Aerospace of North Las Vegas, Nevada is flying prototype hardware that the firm anticipates will advance habitable structures in space to carry out research and manufacturing, among other tasks. The Genesis-1 module was lofted skyward atop a Dnepr booster under contract with ISC Kosmotras. The rocket-a converted Cold War SS-18 Intercontinental Ballistic Missile-roared out of its silo from the Yasny Launch Base, an active Russian strategic missile facility. "That's one small step for Bigelow...one giant leap for entrepreneurial space," reported Mike Gold, corporate counsel for Bigelow Aerospace in Washington, D.C.-on hand for the Dnepr liftoff. "We've had a successful launch. Of course this is just the first step in what's going to be a long mission. We're eager to get more information in regards to the progress of the mission," he said. Bankrolling the expandable space module concept-now roughly a $75 million investment-is businessman, Robert Bigelow, owner of the Budget Suites of America Hotel Chain among other enterprises, and head of Bigelow Aerospace. The rocket shot from the silo into gorgeous weather, Gold said, with Sun shining and mild temperatures at the base. "It could not have been a more beautiful day for a more beautiful launch." Bigelow Aerospace Launch Operations Manager, Michael Thee, added: "It was an incredibly awesome launch that went absolutely according to plan. Everyone here was thrilled with the rocket's performance." The module was injected into orbit by the booster, followed later in the day by the good news that telemetry from the spacecraft was being received by ground controllers. "We have verification that we have confirmed battery temperatures and voltages. We're in touch with it," Thee explained. "It's good news....Genesis-1 is talking, Gold added. "The bottom line is that we've established contact with Genesis-1...a significant milestone." "We're having more success than we are sleep," Gold noted, "but that's the way we like it." 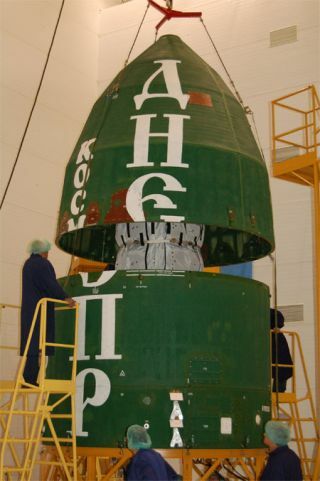 Gold told SPACE.com via phone that this first flight of a Bigelow module was also the inaugural ISC Kosmotras Dnepr takeoff from the Yasny site. If all goes according to plan, the Genesis-1 is to be injected into Earth orbit. From there, the focus of the mission is establishing if both packing of the module and deployment procedures are optimal and functional, he added. Once the module is in orbit, command and control of the hardware will be done through a futuristic-looking Bigelow Aerospace Mission Control Center in North Las Vegas. Ground operators there will also receive video and images from Genesis-1. There is the potential, Gold pointed out, for Genesis-1 to remain in orbit for years with the company's space engineers hoping to learn how the module's systems withstand the harsh space environment-including exposure to natural and human-made space debris, as well as radiation. Extensive testing of the expandable module that's fashioned out of advanced soft-goods material has been done both in the United States and in the Ukraine, he said. "We believe that the expandable Bigelow Aerospace system will not only offer protection equal to traditional habitat designs, but will actually exceed those," Gold said. "Our motto at Bigelow Aerospace is 'fly early and often'. Regardless of the results of Genesis-1, we will launch a follow-up mission rapidly," Gold said. "As a matter of fact, work on Genesis-2 was already underway last year, and is proceeding in earnest as we speak." No mission is ever perfect, Gold added, and Genesis-2-similar in construction and purpose to its predecessor-will help the firm fill any gaps left by Genesis-1 in terms of vehicle performance and capability. "Ultimately, we expect to have anywhere from six to ten sub-scale demonstrator flights, which will help establish both the technology and the business-case necessary for the deployment of a full-scale, private sector expandable habitat," Gold explained. In regard to timing, Bigelow Aerospace could probably launch a mission roughly twice a year, Gold advised. "Of course, the launch date of Genesis-2 will be influenced by the performance of Genesis-1, but, I would expect to see our second mission at some point in late 2006 or early 2007." Gold said that a successor to the Genesis-class hardware is tagged Galaxy. A full-scale expandable module is called the BA-330, a designation noting the 330 cubic meters of usable volume that each individual habitat would provide. The step-by-step increase in size, Gold said, not only will establish the technology but also help build the business case for the Earth orbiting modules. "You don't want to shift from first to fourth gear," he said, the idea being to build familiarity and confidence in experimentation, applications, and space commerce. "From a technical perspective, we will be establishing the conceptual foundation that all future expandable systems will be built upon," Gold said. "You see a lot of Power Point slides and pretty pictures of inflatable habitats in the literature, but, the fact of the matter is...an expandable system has never been tested in an actual orbital environment. No real data currently exists, and hopefully, the Genesis-1 mission can help change this situation dramatically," he added. In a statement from Robert Bigelow on the firm's website: "A free system called capitalism works very well on Earth, and there is nothing about microgravity that changes this. We need to encourage creativity, imagination, and innovation, in order to bring the benefits of space development to fruition, not just for the privileged few, but for all of humanity." Vladimir Mikhailov, First Deputy Director General of Kosmotras, told SPACE.com in a pre-launch phone interview that the Genesis-1 mission will be the company's sixth commercial flight. "We've had a number of U.S. satellites on several of our launches. Sometimes they were pretty small...but this time Genesis-1 is a large satellite," he observed. "Every mission of our launcher is like giving birth to a baby for us," Mikhailov said. "Each one is a special one." More than ten industrial companies and upwards of a 1,000 specialists are involved in booster preparation and launch operations, Mikhailov stated. To launch its module, Bigelow Aerospace has relied on the talents of both Kosmotras and SDO Yuzhonye of the Ukraine-the group that does much of the hardware work on the Dnepr booster itself, Gold said. "Frankly, one of the most difficult aspects of conducting a mission like this is surviving all of the red-tape involved in export control," Gold explained. "Launching the spacecraft in many ways is the easy part, since, by the time you reach that moment, all of the regulatory concerns have been successfully addressed." Whether it's export control, the telemetry system, or identifying quality subcontractors, Gold said that building the system necessary to develop and operate the spacecraft is the first and most crucial step that any program faces. "No matter what happens on Genesis-1 and subsequent missions, we have established the infrastructure to allow for success, and, in the long-run, that is probably the most important accomplishment of all," Gold concluded.